The weekend is looping you in. This week, Perks is taking half off your tab for dinner service at South Beach’s Vinyl & Kai. Also: half off your next pair of cult selvage denim jeans, fresh from the Denim Design Lab. It’s science, in your pants. Stephen Starr’s steakhouse at the W Fort Lauderdale just unveiled a new lunch menu with Warm Bacon & Tomato, Barbeque Pork and Beef Shortrib sandwiches. They’ll also slide you a complimentary beer (Pilsner Urquell, König Ludwig Hefe, Holy Mackerel) with any lunch order if you mention UD. 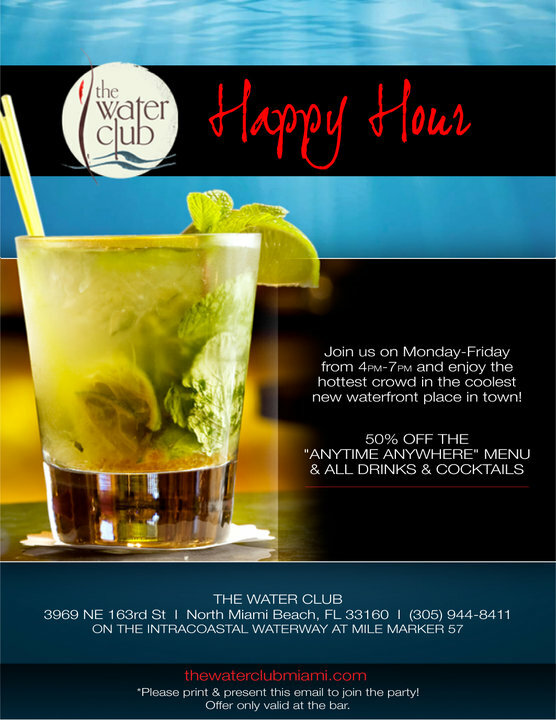 Happy hour has finally arrived at this sprawling waterfront restaurant in North Miami Beach. Beer, wine and well drinks are half off, as are plates off the “Anytime, Anywhere” menu, meaning the only thing that separates you from chicken wings, conch fritters and pastrami sandwiches is a mere $4 to $7. Your final month of summer 2010 is sure to be filled with barbecues, yacht parties and impromptu bikini frolicking. So you’ll need some fresh clothes. The NY-based Gansevoort shop is unloading its spring and summer inventory at deep discounts. You can find jeans from Ksubi for $89 and T-shirts from Trovata for $39.